The following is the updated information for Sequoia Fund and T. Rowe Price Retirement Income Fund. These funds have been selected as the Top S&P Mutual Funds of 2011. Details for these funds can be found below. 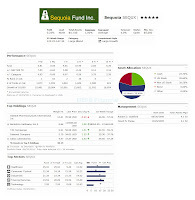 Sequoia fund has been selected as the Top S&P Mutual Funds of 2011. This fund invests mainly in undervalued US Companies. It may also invest in foreign securities. This large blend US stock mutual fund has been rated the best fund by Morningstar with 5 star rating. 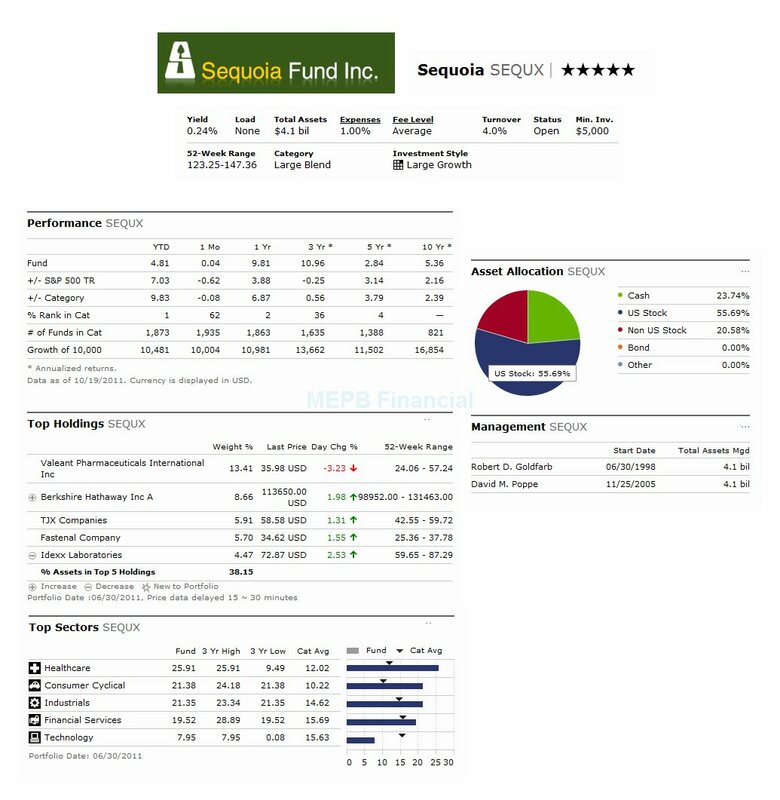 More details about the fund's review can be found on my previous article, Sequoia Fund (SEQUX). This fund has recorded 34 years of positive return and only 6 years of negative return so far. Morningstar gave this fund 5-star rating. The best achievement of 1-year total return was in 1997 with 43.20% and the worst was in 2008 with -27.03%. The top 5 holdings of this fund as of June 30, 2011 are Valeant Pharmaceuticals International Inc, Berkshire Hathaway Inc, TJX Companies, Fastenal Company and Idexx Laboratories. T. Rowe Price Retirement Income Fund invests in 40% stock funds and 60% bond funds. This balanced fund is managed by Jerome A. Clark. These mutual fund is part of fund of funds.Morningstar has rated this fund 3-star rating. S&P also has awarded this fund with the top mutual fund award of 2011. This TRRIX fund has performed in 7 years of positive return. The 1-year total return was negative so far only in 2008 (-18.39%). The best 1-year total return was achieved in year 2009 (22.07%). Based on the load adjusted return, this fund has returned 0.52% over the past year and 3.19% over the past 3-year. The top 10 holdings are Emerging Markets Bond Fund, Emerging Markets Bond Fund, Equity Index 500 Fund, High Yield Fund, Inflation Focused Bond Fund, International Bond Fund, International Growth & Income Fund, International Stock Fund, New Income Fund and Overseas Stock Fund.